PM reappoints MK Eli Ben-Dahan as Deputy DM after Jewish Home threatens not to vote with coalition. Prime Minister Binyamin Netanyahu agreed Sunday evening to reinstate Eli Ben-Dahan as Deputy Defense Minister. Earlier, the Jewish Home faction announced that it would not vote with the coalition until MK Eli Ben-Dahan was re-appointed. Ben-Dahan's term as Deputy Defense Minister automatically ended when former Defense Minister Avigdor Liberman submitted his resignation. Netanyahu's associates had promised to raise the issue for discussion and vote at today's cabinet meeting, but in the end the vote did not occur. The Jewish Home faction blamed Netanyahu's initial refusal to allow Ben-Dahan to continue serving as Deputy Defense Minister on an attempt by the prime minister to pressure the party in a bid to avoid early elections. 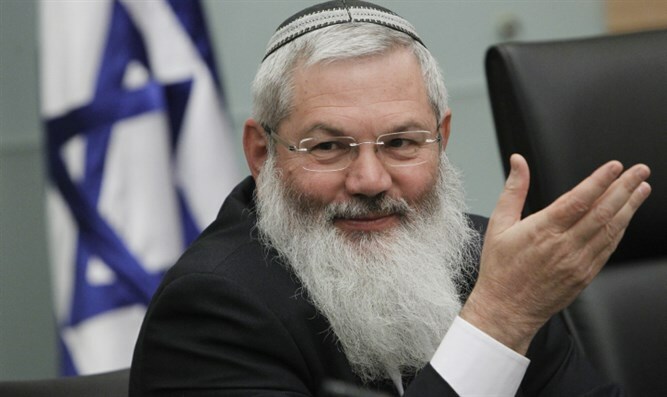 "In the past few hours, we have worked intensively with the Prime Minister's Bureau to prevent the unfair decision to dismiss the deputy defense minister, Rabbi Eli Ben Dahan, who was rejected for no reason," the faction's statement said. "Unfortunately, the prime minister and those who act with force against the Jewish Home, as they would not have done with any other party, created an asymmetrical situation in which the deputy defense minister was forced to pay the price for the disgraceful resignation of the defense minister who ran away from his responsibility," the party continued. "There is no reason to fire a whole team of deputy ministers and advisers and send some families to immediate unemployment because of an inexplicable whim," the statement added. "Unfortunately, despite repeated requests, the Prime Minister's Office remains silent." "We will not allow this absurdity, so the Jewish Home Party will not vote with the coalition in any vote until the prime minister retracts his decision," the party's statement said.